Rebecca and I had the pleasure of seeing the Trisha Brown Dance Company at BAM last week perform in works of repertory and the final pieces of Brown’s choreographic career. We thought this event warranted a conversation instead of a review. What follows are some snippets of our lengthy chat–some of which will be forever classified–to be read as if primary colored screens periodically descended down in front of our sentences. Of course, during the two nights I was at the show, I couldn’t help but be aware of how much rigor is in Brown’s work, both in the physicality and the composition. Yet later on, I kept wondering why everyone was so upset with this comment. Though he is definitely dismissive, I grant that Macaulay is entitled to his own (potentially limited) opinion; but so many dancers and choreographers could not even grant him that since he touched on such a nerve in the larger dance community. Beyond the obvious rigor in her work, which is apparent to anyone who has ever stepped foot into a studio, the dances also seem to be inherently risky. RH: His comment annoyed me, too, but that’s a good point, actually. I think it might be a feeling of being misunderstood—on behalf of Brown’s work—that makes people so enraged. I also felt like he exploited her “path of least resistance” comment. She isn’t finding these paths that are self-evident and known to everyone; she’s actually creating paths in her movement. If the movement is easy for her, it definitely isn’t easy for others to learn it! The patterns, the groupings, and the movement itself are all quite rigorous, to my eye. And also do require technical skills like extension, precision, balance…exactly what you said, physically and compositionally rigorous. CT: In the program, there was a great short essay by Stephen Petronio in which he exquisitely describes Brown’s technique as “more upright than the contact improvisation work that led me to her, but it has that same alert openness, the same malleable continuum. FLUID. It’s unwillful and more like bodysurfing in gentle rolling heaves, or riding on swift, soft jets of air.” Though this rather evocative description does correctly relay the “ease” in her choreography it also acknowledges the necessary command an artist must have to create such “calligraphic journeys.” And I agree with you. Dance is a nonverbal art, so often I think the community gets overly frustrating when a guiding light such as Brown is rendered so incoherently in the mainstream press. RH: The show really got me thinking about epic collaborations…the designs for Newark, Set and Reset, and I’m going to toss my arms… were all wonderful. CT: Do you think there are comparable collaborations like this, between the art and dance world, happening now? RH: I don’t really think so…I mean, I think a lot of choreographers still like to commission music, and there’s usually a costume designer and a lighting designer. These elements can all be really interesting or add to the choreography, but I don’t feel like I see collaborations on the same scale. I’m wondering if it’s an economic thing. Of course it would cost money to collaborate with visual artists and musicians. CT: But is that a cop out? I am sure Brown’s company was not always flush. RH: Good point! I guess she started making works for the proscenium stage almost 20 years into her career. I think Glacial Decoy, in 1979, was the first. Her works before that were creative and imaginative…just simpler, I’d say, like Homemade. But I really do wonder how much it would cost to hire such a high-profile artist as Robert Rauschenberg now. I think it goes back to the relationship between the visual arts and dance communities in the 1960s and 1970s. Perhaps it felt less separate, so collaboration was more like a favor between friends instead of a business decision? CT: Sure. I don’t think Einstein on the Beach could be made if Robert Wilson, Philip Glass, and Lucinda Childs all wanted to make money off each other. As it was, I think Glass ended that first run in huge debt. They collaborated because they were peers and colleagues crossing genres, not because they anticipated being a “dream team.” Plus, Rauschenberg, Judd, Anderson, and Brown are not random partners. Their respective artistic statements of the time had a crossover with one another. RH: Hm, yes, maybe there is a sense of there being too much at stake? CT: When I was watching Newark, I felt at times like I was watching an experiment, in a good way. It made me think that when choreographers now get a good venue, commission, or grant, there is a huge amount of pressure for this finished, sparkling piece to show for it. I don’t know how Brown got around that pressure, but her work–and this is where I come back to the idea of risk–seems to fly in the face of that stricture. It is playful and it is not afraid of a collaborator’s viewpoint (even when that viewpoint decides to put an opaque screen in front of the dancing as in Newark) messing it up. I cannot help but think many new collaborations are dead on arrival due to this kind of squeeze between the resources of time and money on one side and the final product on the other. Maybe it just comes down to a fear of losing control and feeling like you only get one shot? RH: Have you seen any really good collaborations as of late? CT: Well, last year the most moving collaboration I stumbled across was the solo that Monica Bill Barnes made for the satirist David Rakoff, which he performed in the middle of a reading of an essay for the This American Life live show. It was such a beautiful integration of the verbal and nonverbal, giving a fullness and depth of experience to Rakoff’s hilarious and tragic narrative. Hofesh Shechter’s Political Mother at BAM was an interesting and jarring juxtaposition of modern dance and thrash metal music. Who doesn’t like the surprise of being handed earplugs when walking into an opera house? And then there are other choreographers who are making beautiful sculptures and installations for their dances… Laura Peterson Choreography comes to mind for both the sculpture in Failure and the lush grass and driftwood set of Wooden at HERE Arts. But are the newest lights on the dance scene intimate with their peers in the visual art and music world? Is any organization actively seeking to develop these kind of partnerships? Most recently, Veal, at The Invisible Dog Gallery was much talked about, and I regret I was unable to see this collaboration between a design team and a Cunningham alum. RH: It was so great to see this piece after reading so much about it. I wrote a little research paper on Brown for a dance history class a couple of years ago. So I had seen Set and Reset on video, but didn’t really understand how Rauschenberg’s projections worked, and couldn’t tell from video how the translucent legs and scrim would look. The curtain opened to reveal two pyramid-shaped screens on either side of a rectangular screen. From where I was sitting in the orchestra they looked really large. Rauschenberg’s projections played on these screens, for the entire dance, but after a few minutes they were flown up and hovered above the stage. Then the dancers came out. CT: The projections are overwhelmingly militaristic and bureaucratic, like a 50’s redux, and they hover like any past. 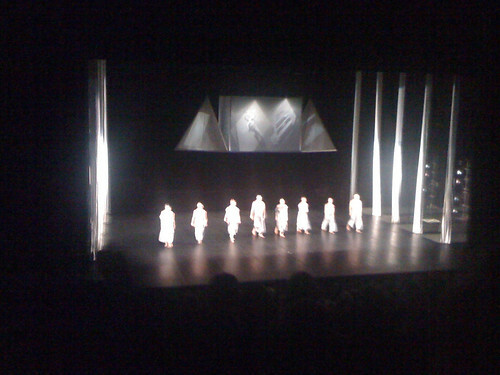 For me, I loved watching the dancers move to Laurie Anderson’s Long Time, No See. The quirkiness catches you off guard and leaves you open to the possibility of a different future that seems to be unfolding right below. She has this indelible way of combining hard and soft, serious and fun. RH:I loved seeing the dancers prepare to come onstage and cross over behind the scrim. The whole dance is so playful and imaginative. The energy and momentum are infectious…so I was super pleased to see it live. CT: I loved this piece. Seeing it made me think that everything creative I could ever think of has already been done. Video and dance is certainly not new, but a video camera dancing on someone’s back is one of the most innovative ways I have ever seen film interact with movement. And this solo is from 1966! RH: Yes! Homemade is another one of the pieces of Brown’s that I had read about but couldn’t really picture. It was short and sweet, and really exciting to see the film move around the space. A dancer on film has more access to the theater space than the dancer herself! Or just thinking about how to make dance endless or limitless…this seems to me to be something that Brown does very well. CT: Again, there is this ever present paradox in her work. When every piece ends, there is a feeling that the movement is not done, that it is continuing on somewhere…in the dressing room, orchestra pit, out on the street. How to make the fleeting so continuous? That answer is the secret to her magic. There was also a palpable love in the audience for Vicky Shick. This show inspired such camaraderie. RH: Yes! The feeling that the movement is continuing somewhere was also present in Newark. The brightly-colored Donald Judd screens that would obscure and reveal the action on stage made it possible to imagine an infinite number of hidden dances happening on the stage. I’ve never seen a dance like that before…although I think there are Cunningham dances where the curtain closes on movement instead of stillness. CT: I had no idea where that piece was going to go. The fact that it revved up to the two co-ed pas de deuxs, with the men and women doing equally difficult partnering right next to each other, was a surprise. Again, isn’t the rigor so obvious? Tamara Riewe, Tara Lorenzen, Stuart Shugg, Nicholas Strafaccia in Newark. RH: Indeed. I think Newark was my favorite piece. As much as I love Set and Reset. The dancers looked incredible. I think this dance was part of Brown’s cycle of “valiant” dances. The weight-sharing and lifts were so extreme that I actually got kind of nervous! But definitely a lot of technique and rigor at work there. What did you think of the new piece? CT: So I was at a dinner party last weekend and I was made aware of the process of translation that went into the new work. Did you have a sense that, potentially, this piece reflected more the taste of others or that we were viewing Brown’s choreography through the filter of one of her dancers? RH: Hmmm…I’d say the latter. As long as she credits it as one of her final pieces, I’ll accept it as reflecting her own taste. I didn’t feel like I was seeing knock-off Brown or anything like that. RH: Definitely less exuberant. The music was lovely, though. What did you think of having the pianist onstage? And the effects of Burt Barr’s fans? I actually could have done without the fans. They looked nice, but they were so far stage left that when the action began moving towards stage right, it was easy to forget about them. But they did provide a reason for the parts of the costumes to come off, even if they weren’t actually being blown off. I thought that the costumes were very integrated into the choreography. CT: I disagree with you there. I didn’t hate the costumes by Kaye Voyce–billowy white pajamas that had accordion pleats in different areas for different dancers and eventually sort of fell off or were stripped away–but I also thought they were unnecessarily fussy. Of course, it was so dramatic to see a few of the pieces get blown around on the floor. And the fans, the shadow of an overhead fan spinning slowly over them all really added to the piece for me. Small moments such as these were really poignant. Dancing-wise, I found myself really become more engaged during the men’s pas de quatre. The exquisite connections and near misses blew them slowly across the stage. RH: Ah, I couldn’t see the shadow of the overhead fan where I was sitting…or I just didn’t notice it. CT: It was only visible from the mezzanine, where I was on opening night with friends. I often think that if the press were given mezzanine instead of orchestra seats, the reviews would be more lively. As great as it was to see the dancers up close in my press seat, I think taking in a group dance work involving a set and lighting design often benefits from a little bit of perspective. CT: I am rather fascinated by the company’s plans to move Brown’s work into museum spaces after the proscenium farewell tour. Even in retirement, Brown, or at least her board members, are pushing into new territory for a single-artist dance company. I wonder if the plans for the Marina Abramovic performance museum influenced this choice of preservation? RH: It seems like a shame to me…I’m thinking of it from a dancer/audience experience perspective…just that it was wonderful for me to see these pieces performed on the BAM stage, and I’ll be sad for that to end. And I’m sure the dancers will be sad, too. I’m not sure what to think about the company’s plans. It’ll be interesting to see how it plays out, to see what exactly they end up doing in the museum spaces. It definitely seems to be the hot new thing, dance in museums. I don’t understand exactly why they’re doing this, though. CT: I suppose there is a fear of the work becoming stale if they were to continue to tour the proscenium repertory indefinitely. Maybe they will do revivals from time to time. I think the dance world could learn from how the art world seeks to preserve performance art. There is a balance that needs to be struck in continuing to perform repertory, because it can get rote so quickly and easily. I can’t tell you how many ballets I have learned from video and how soul-killing that process can be. The idea of re-performance where hopefully some of the conditions surrounding the original work can be felt anew by the new performers could be a solution. RH: I like how you phrased that: the performers feeling the conditions anew. Very important. I understand the fear of staleness, but Brown’s work is just so beautiful…I wonder if they couldn’t keep passing it along from dancer to dancer with the same integrity. But maybe they’re just doing what needs to be done. It’s hard for me to understand the economic aspects of maintaining a company, and I’m sure that is difficult, too, without the creation of new works. Did you see this show or some other show in Brown’s illustrious past? Please post a comment and keep the conversation going. On rigor and precision–I talked to a former TBDC dancer who recalled that Trisha would spend an entire hour just making sure everyone’s arms were level, so that the dancers could know and feel the correct height! Wow. Thanks for the anecdote! It seems like precision is the most unexpected element in her whimsical and naturalistic phrasing of movement.